Max and Annie love each other almost as much as Charades and Scrabble, which is why it’s so easy for the audience to fall in love with them in “Game Night,” a film in which everyone wins. Max (Jason Bateman) and Annie (Rachel McAdams) are a married couple who were brought together by their love of board games and trivia, and the highlight of their week is hosting a weekly game night with friends sand Max’s rich brother, Brooks (Kyle Chandler). Perhaps no one takes board games as seriously as those who gather at Max and Annie’s house in a middle-class neighborhood before Brooks decides to take over the game and move it to his posh new residence. But Brooks – always focused on trying to one-up his younger brother – sets up a mystery game that includes actors and a staged kidnapping and one rule: the first couple to find Books wins Brooks’ vintage Corvette Stingray, which just so happens to be Max’s dream car that he could never afford. But the game take a turn when Brooks gets kidnapped in real life, while the group believing its just part of a game – until it’s too late. What transpires over the next 93 minutes is a welcome surprise. 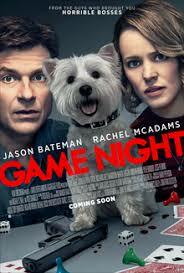 The humor, witty banter and array of plot twists make “Game Night” one of the best date movies in recent years. 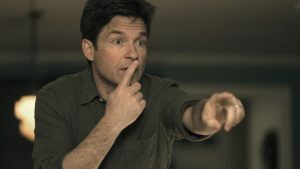 It’s very fun, enjoyable film, with Bateman’s deadpan humor and sarcasm a perfect complement to McAdams’ naivete, while the other couples also play off each other very well. The difference in age and maturity between Sarah (Sharon Horgan) and Ryan (Billy Magnussen) make for easy punchlines, while long-time married couple Michelle (Kylie Bunbury) and Kevin (Lamorne Morris) have a few scenes in which they’ll have the audience laughing uncontrollably. And then there’s Jesse Plemons, who gives one of the best performances of his career as Max and Annie’s weird next-door neighbor, a police officer who’s simply looking for friends after his wife recently left him, taking his invitation to game night with her. “Game Night” isn’t a perfect date movie, but it’s close – real close. It’s story is easy to follow yet extremely difficult to predict and delivers a curveball ending that would make “The Usual Suspects” proud. For as bad directors John Francis Daley and Jonathan Goldstein were a few years ago when they made the “Vacation” reboot, they redeemed themselves in the comedic genre with ‘Game Night.” The humor isn’t on the level as “Bridesmaids” and “The Hangover,” but there are very few times in which more than a few minutes pass without genuine humor. And you shouldn’t play it alone.